The E2D LED Defender Ultra is a compact, high intensity flashlight with dual-output capability and self-defense enhancements. 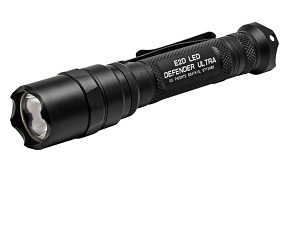 Utilizing a virtually indestructible high-performance LED and a Total Internal Reflection (TIR) lens, the E2D defender features a high 500 lumen (2 1/4 hour run time) and a low 5 lumen (67 3/4 hour run time) option through a simple push button tailcap. The E2D's 500 lumen light is sure to momentarily blind any attacker and the crenelated Strike Bezel® provides further defensive options should the need arise. Features a High-strength aerospace aluminum body, Mil-Spec hard-anodized for extreme durability. Slim and compact, the E2D is an excellent all day carry light.